Da Vinci Diamonds is a pretty straightforward game. Start by setting your bet. You always bet on 20 paylines, so you just have to decide how much you would like to bet per line, or the so called “Line Bet”. This can range from £0.01 per line – which makes it a minimum of £0.20 per spin, all the way up to a £5 per line making it a maximum of £100 per spin. Once you’ve set your bet, feel free to hit the “Spin” button at any time! From highest to lowest value, the symbols in Da Vinci Diamonds are: Da Vinci Diamonds logo, Mona Lisa, Portrait of a Musician, Lady with an Ermine, Red Stone, Green Stone, Yellow Stone. Additionally, there is a Wild symbol, which says Wild on it and can replace all symbols to form a winning payline, and a Bonus symbol, which functions as a Scatter to trigger the Free Spins Bonus round. The game has a fixed jackpot, which can be yours if you spin 5 of the “Da Vinci Diamond” logos. What’s the prize? 5,000x your line bet! 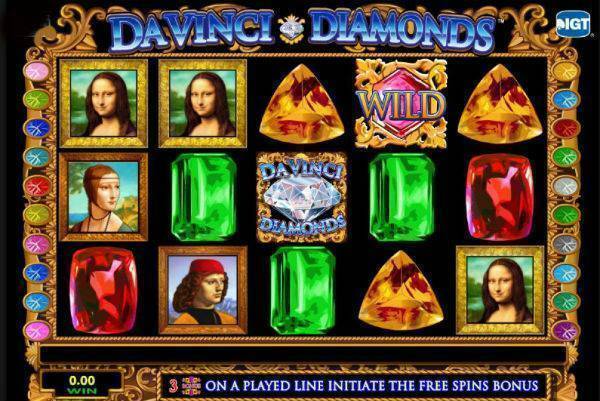 The next prize is if you spin 4 of the “Da Vinci Diamond” logos, which will land you 2,000x your bet. Make sure you keep your eyes open for that logo, because it’s significantly more valuable than any of the other symbols! 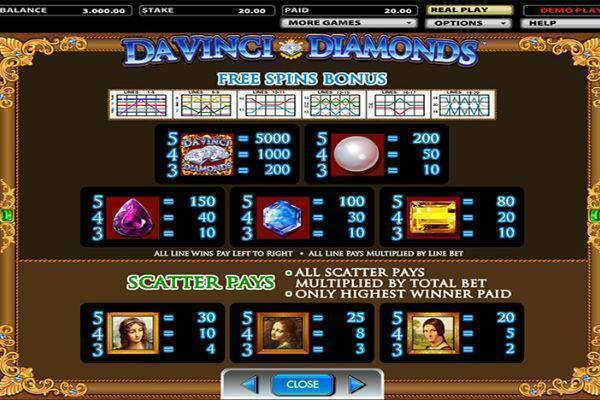 Da Vinci Diamonds also has a Free Spins Bonus game. You will enter it when you land 3 Bonus symbols on reels 1, 2 and 3. The bonus game comes with 6 free spins, and during this round you can get up to 15 more free spins when you spin 3 or more symbols on any of the reels. And of course, there’s the Tumbling Reels feature, which you get the moment you start playing your game. You’ll see right away that the symbols simply fall into place, and when you have a winning payline, those symbols will vanish. Remaining symbols fall into their place, with new symbols tumbling down to replace the empty spaces. That means that if you were just one place off for another payline, the tumbling reels might just give you an extra win as everything tumbles into place! Better yet, the symbols just keep tumbling until there are no more new winning paylines, and only when it stops do you have to press the “Spin” button again! Da Vinci Diamonds has a luscious and luxurious feeling, with golden picture frames and the most famous classical paintings from Leondardo Davinci – Mona Lisa, Portrait of a Musician, and Lady with an Ermine, and it’s made all the more vibrant with the colourful jewels. The soundtrack is unobtrusive – each spin is accompanied by the sounds of a harpsichord, and wins come with magical whooshes as the symbols vanish into thin air. Da Vinci Diamonds is a hit with many players, and it’s not difficult to see why. The game is easy to get into with the elegant and visually pleasing theme. There’s nothing too complicated here, but there’s still enough features to keep things exciting, like the free spins round that can be re-triggered. The tumbling reels that keep on replacing symbols until you have no more paylines is also pretty cool, as you might already know that a lot of the time you are just one symbol off from winning! Take a peek at this game and you too will start seeing the beauty behind Da Vinci Diamonds.